August: Piranaha. 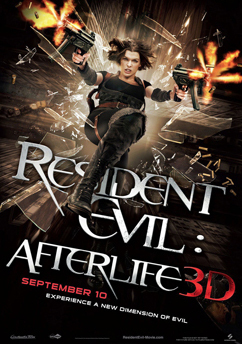 September: Resident Evil: Afterlife. October. Saw. I was so psyched to go to the theater for all three to get the full 3D experience on the big screen rather than waiting for them to hit Blu-Ray. When I saw Piranha a couple of weeks ago, the 3D got annoyingly blurry throughout the entire film so I assumed we’d sat too close to the screen. So when I went to see Resident Evil: Afterlife this weekend, I made sure to sit further away from the screen. Not even 30 minutes into the film I was ready to take the 3D glasses off and call it quits. It was giving me double vision and not even astounding me with any in-your-face novelty. It was just an annoyance to the whole movie-watching experience. There is NO way I’m going to invest in a 3D television and sit in my living room with glasses on for 3 hours every night just to watch real housewives throw tables at me. But even that would be better than the choreographed and staged situations in Afterlife that spoil some great action sequences, with the actors way too aware of playing to the 3D gimmick. Milla Jovovich and her cast mates spend the movie wearing ridiculous expressions on their faces while frozen in “action” poses, looking like video store standees being pushed towards the camera! I can’t wait to watch this film again on Blu-ray…in 2D. 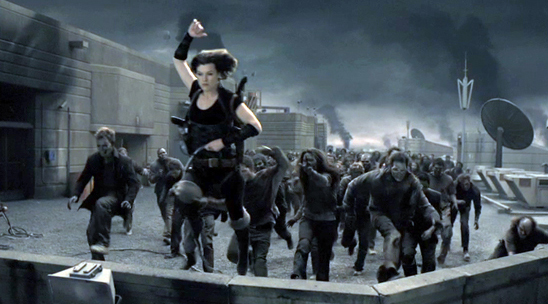 Following the trend of the game series, the Resident Evil movies are no longer horror films, but all-out action films. As with the second film, Apocalypse, Afterlife takes pains to cater to the lovers of the video games, loading itself with images, characters and boss battles right out of the series, all the way up to Resident Evil 5. 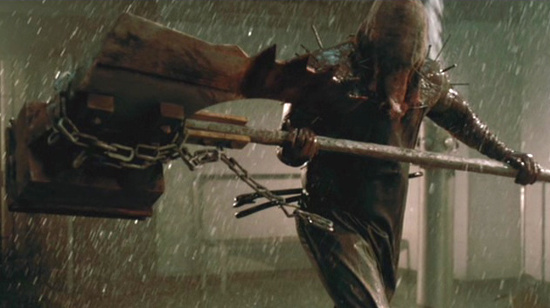 Gamers will recognize the big scary guy with the giant hammer/axe, the introduction of Clare Redfield’s brother Chris, new strains of zombies with heads that split open to reveal serpent like tentacles, Wesker’s teleporting act, and the jeweled spider devices that control those to whose chests they are attached. Even the plot is moving away from its zombie roots (just like the games), but the new direction is just as entertaining, and the film’s ending demands that the next sequel pickup right where this one leaves off. The only real problem with Afterlife is the plot holes, the worst being one that has everyone stumped, involving Alice getting into a plane crash that would surely have left her dead. Instead, she appears in the next reel completely unscathed and with absolutely no explanation at any point in the remainder of the movie as to how she survived. It’s such a glaring problem that tarnishes the entire film, which is, thankfully, saved by that promise of a whole new life to the series and the integration of favorite characters from the games. And speaking of favorite character, for months the internet has been abuzz with talk of the Jill Valentine character being listed in the cast of Afterlife—a crucial draw for fans who loved the dead-on representation of the Jill video game character in Apocalypse and were mystified as to how she was not even mentioned in Extinction. Well, she is indeed coming back…and does appear in Afterlife. However, since I purposely did not read message boards for fear of spoilers, I did not learn that Jill appears AFTER the final credits have already rolled. And unfortunately, the dweeb running the projector at the theater I saw the film in brought the lights up before the movie had even fully ended! By the time the credits rolled, everyone in the theater was already out of their seats and walking towards the exit. So none of us was aware that there was going to be an epilogue. My life feels SO incomplete now, and will until the dang movie comes out on Blu-ray in a couple of months and I finally see the true ending… Agony! This entry was posted in Movie Times & Television Schedules - Staying Entertained, The Evil of the Thriller - Everything Horror and tagged living dead, Milla Jovovich, Resident Evil Afterlife, undead, Zombies. Bookmark the permalink.